NEW YORK – in the mid-1990s, a nationwide campaign took aim on drunk drivers. The slogan, “friends don’t let friends drive drunk” was plastered on billboards from Boston to Los Angeles. Law enforcement stepped-up sobriety checkpoints; and arrests for driving under the influence sharply increased. Today, drinking and driving is still a common problem on the roads but it’s taken a back-seat to an issue many experts consider to be just as dangerous but much more prevalent: texting. “When a driver looks down to view a text message, they’re putting lives on the line. Even if a driver is distracted for just three seconds, a car can travel over 300 feet without eyes on the highway in New York traffic.” accident attorney Ross Cellino said. New York State Governor Andrew Cuomo’s office reports there was a 143 percent increase in cell phone-related crashes between 2005 and 2011. In the same time, the state reported an 18 percent decrease in alcohol-related crashes. Statistics show New York State law enforcement officers recorded fewer than 5,000 alcohol-related crashes in 2011. The same year, officers tallied over 25,000 crashes involving at least one distracted driver, now the most common factor leading to a crash. Local and state officials are very cognizant of the texting trend and New York State is leading the charge in the battle against texting and driving. Statewide, the number of texting while driving citations increased 35 percent in one year. In 2014, officers handed out more than 75,000 tickets, up from 56,000 in 2013. As part of New York Mayor Bill de Blasio’s “Vision Zero” campaign, the city has been a hotbed for texting citations, which increased by almost 50 percent to 48,000 tickets issued in 2014. According to the National Highway Traffic Safety Administration, 2013 saw more than 3,000 people get killed in crashes involving a distracted driver and another 425,000 were hurt. New York law enforcement officers warn the only true way to avoid a texting citation is to turn your phone off and put it out of sight so you’re not tempted to shift your focus off the road. 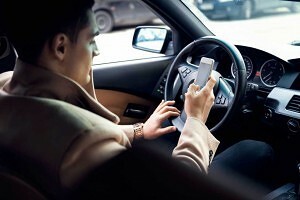 BUFFALO, N.Y. – Distracted driving is the number one reason accidents happen in New York State. Driver inattention accounts for nearly 20 percent of all crashes, resulting in thousands of injuries. Although distractions like texting and driving are still a top cause of accidents, statistics show strict laws prevent some of these crashes from happening. Most states, including New York, have bans on texting and driving and new research has found how important these laws are. Car crash hospitalizations dipped in states that have strict bans on texting and driving between 2003 and 2010. Researchers found that overall, the number of those hospitalized in these states declined by 7 percent, compared to states without a texting ban. Currently, 45 states and the District of Columbia ban drivers from texting. However, five of those states do not completely ban the dangerous activity. Several places only restrict teenagers or those with driver permits from texting behind the wheel. According to the Centers for Disease Control and Prevention, nine Americans are killed every day by a distracted driver. 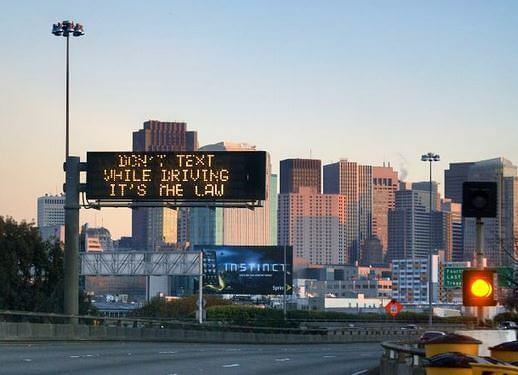 Researchers hope their findings can influence more states to include primary enforcement of texting and driving to the law books and improve highway safety nationwide. ROCHESTER, N.Y. – We don’t need researchers or studies to tell us that driver distractions are at an all-time high. Drivers today have more gizmos and gadgets inside their cars than ever before and heavy rush-hour traffic doesn’t help a waning attention span either. What you may not know is that taking your eyes off the road for just two seconds can raise the risk of an accident up to 24 times. According to new research, simple tasks like eating a cheeseburger, sipping a drink, smoking, or adjusting the radio can cause severe and sometimes deadly crashes. “Texting and driving is one of the worst distractions for drivers on the road today. It’s been shown to be just as dangerous as being drunk behind the wheel and police records show many drivers are texting while behind the wheel in Rochester,” car accident attorney Ross Cellino said. The study of 3,000 teenage drivers found that interactive presentations can be a more effective way to raise awareness than in traditional classroom environments. Researchers suggest teenagers taking driving classes will often listen passively and therefore, do not grasp the seriousness of distracted driving. The study, administered by Oregon State University, most notably found that “hands-free” devices are no safer than a hand-held cell phone. Researchers say the real distraction is the person on the phone, who is not in the car and oblivious to the traffic ahead. Women were also noted to be more likely to use a cell phone while driving, and men are more likely to look away from the road while talking to others in the car. Researchers concluded that increased driver training is crucial in the quest to curb distracted driving.